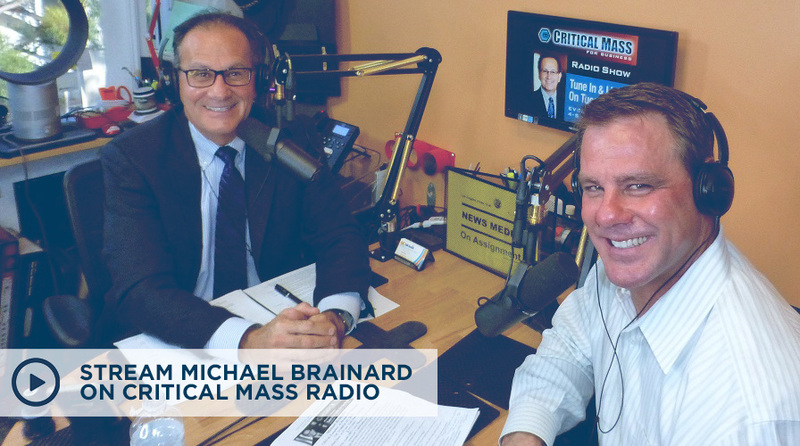 On October 25, 2016, Michael Brainard joined Ric Franzi on his 951st(!!!) episode of the Critical Mass for Business radio program, part of the OCTalkRadio network. FRANZI: It’s hard to get people to change their behavior, isn’t it? BRAINARD: Particularly mid-career moderately successful executives. Michael then goes on to explain that it’s important to tie learning to new and urgent events or business challenges that are pertinent to that particular leader or industry. BRAINARD: The second thing we try to do is create a learning gap. It’s very, very important that we don’t develop people to be “nice.” We don’t develop people to be “caring.” We have to realize that successful adults are usually pretty righteous. They might not say it that way. We create a learning gap by using assessments, by using feedback, by using objective third parties intervention, 360s, things like this. I believe that without creating a learning gap, the uptake on any behavior change goes down. FRANZI: When you say “learning gap,” that is in the eyes of the person that you’re looking to help and improve and change their behavior? So they have to realize, “I have a gap.” Uh… Paul, can you hit the gong please? We hear the sound effect of a gong, or maybe an actual gong. FRANZI: I think Michael Brainard just gave us a teachable moment here at Critical Mass. I think that’s true across the spectrum. People have to feel comfortable with the fact that we’ve identified a gap and we’re here to help you cross that gap. BRAINARD: Without that gap, where’s the urgency or the need to change?